John Coal Train. Very clever, funny. Aw, I was hoping it would be a video of the train. It is a beautiful sight though, big blue skies, looks like classic American West. I too love how you got the “heavenly” sunbeams to shine down on your train shot. Someone must be shining down on you and hopefully keeping you safe tonight. Hard to imagine there could be storms out there tonight when the sky was this clear today. Be safe tonight Matt. I can imagine the engineer’s puzzlement at seeing Matt and his cart. Joking side of me: Matt did you do the raise your arm in the air, pull down…to get the conductor to blow his horn kind of thing? I wonder .. did he…. Hay any fair maidens tied to the tracks?? If you want a shout a day for the matt walk pool (winner gets the sure joy enjoyment of saying I won!! he made it safely) I will post a email today so you can give a date… Name and city, state, country. We can only hope knowing that maybe our energy together reaches Matt and his spirit..his journey and this adventure we are all sharing..BIG THANKS TO MATT……onward …. I’ve been thinking about that day. Hobo Nation will have to celebrate. Everywhere we are, we should all throw WELCOME TO OREGON MATT parties. nice train shot, Matt. Looks like a toy train to me, the sky is so big. Right on! Let’s all take photos of us raising our glasses to Matt when he reaches Rockaway Beach and then email them to him. Hobo Nation…….I LOVE IT! OMG…that should be the title of the book. There it is. Post that e-mail address, Jeff. I’ve been thinking of a date, and once I settle on one (in about 89 days, hee hee), I’ll send in my pick for day, etc. As for our energy reaching Matt, I’m thinking it’s been doing that since day one, and vice versa. Also, I personally feel energy from all of the people commenting on here, so many thanks to Matt, and everyone else on here. 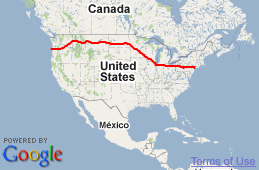 Approximately how many miles does have left until he arrives at his destination in Oregon? I’ve lost track, and my computer is running too slow to see his locator beacon. Thanks. M A T T fact: He has….drum roll..please….1392 miles from the Pharmacy in Bizmark to his destination..of Pacific Ocean at Rockaway Beach Oregon .. .but with his trails and detours….i would think this is within a 100 miles plus. Thanks a bunch, Jeff, and I made note of your creative e-mail for the pool. I’ll be e-mailing with the same name used here, as soon as I pick a date/time. I’m gonna post it like promised on todays postings (day 91 that is) but here is the email for Matts walking pool….I will post the dates on a calander…and we will see where the breeze takes us ..as we root Matt on. Just a simple email….and I will acknowledge. By the way happy half christmas to all who celebrate it…Christmas that is. Do we get presents today too on half Christmas? I never seem to get mine. Maybe “Santa’s” reindeer eat them just like the deer in my yard eating my flowers! Well last night/early this morning Not Santa, but the tooth fairy did leave a present today for my Youngest Corrie…alas she lost a tooth. In honor of Matt’s walk she left a Sacajawea gold coin. (not realy but this is what the tooth fairy leaves in our house). Happy Half Christmas….Your Present and everyone else’s is our membership in the Hobo Nation aka: Matt Greene fan club. 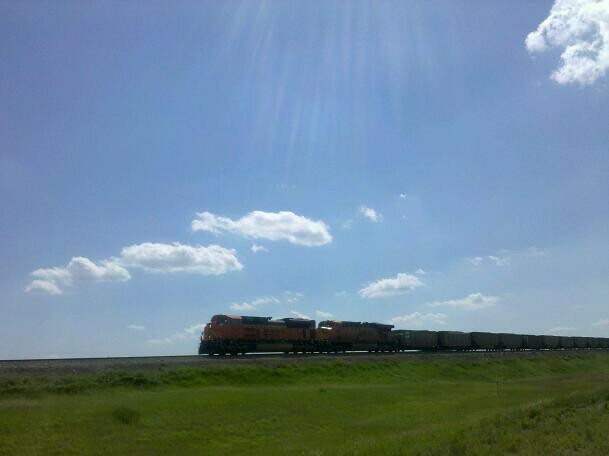 In fact, most of your pictures along this long stretch of ND have had trains. Either you stop to watch the train pass and decide to take a picture or the trains are passing all the time. Judging from the shots I’ve culled from google street view, I think it is the latter. Anyone notice the ‘light beams’ in the top center of the picture. Must be someone above watching over Matt! Or those aliens are hovering – about to catch Matt! I’m glad you have so much time to think of great puns that totally aren’t lame in the least. Before I read the posts – I’m just going to say – Wow – great TRAIN! I’m asking. Fill me in, Candice. I’m loving the rays from the sky….a train from heaaaaven! Yep, 18 of ’em every day pass through here. Some serious cash.